Digital printing t-shirts, a new type of t-shirt printing that offers an alternative to the traditional screen printing method, is a surefire way to create custom designed t-shirts that represent your business in the best way possible. Even better, digital printing t-shirts will ensure that your custom designed t-shirts are produced efficiently both in terms of time and money. This technique also gives your business more flexibility with being able to produce variations of the same shirt, and it also allows for a higher resolution and overall quality in the design of your shirts. Read on to learn four advantages that might just make digital printing t-shirts the perfect option for your business. Image quality is one of the biggest reasons that many businesses choose to digitally print their t-shirts. Digital printing simply allows for a higher resolution, giving your shirts a cleaner overall appearance. This high quality appearance is what initially made digital printing popular, though there are also additional benefits. The custom designed t-shirts that you produce for your business will be an extension of your brand, so focusing on image quality is truly worthwhile. You want to make sure that your brand's custom designed t-shirts are eye-catching, and digital printing t-shirts is a way to make that happen. One of the biggest perks that comes along with digital printing t-shirts for your business is an increased level of efficiency. This efficiency means that you are able to get your t-shirts produced with a much faster turnaround time. 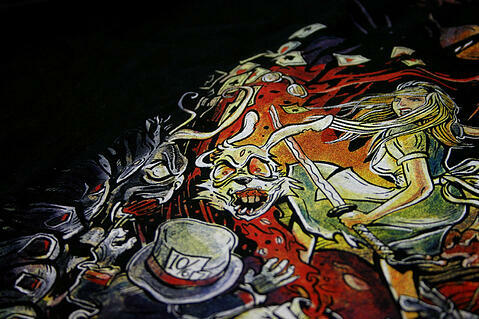 If you need custom t-shirts fast, digital printing will likely be the best way to accomplish that. This boost in efficiency is primarily due to the fact that traditional screen printing is very time and labor intensive. A busy print shop will sometimes have a wait time of several weeks before you are able to see the design of your t-shirts firsthand. With digital printing, you can cut down on the wait time and see results faster. Because digital printing t-shirts is much less labor intensive than the screen printing method, it allows your business the option of producing small batches of shirts. This in turn means that you can create a variety of designs within your order and have them all completed in one batch. Variation is great because it will give you a chance to test out different designs that you might have in mind. Whether you are looking for multiple shirts commemorating the same events or just trying to get a number of different branding methods out there, producing a variety of custom design t-shirts is a great way to go. Of course, the decision about whether or not to digitally print t-shirts for your business will likely come down to price considerations. In addition to the other reasons detailed above, digitally printing t-shirts became popular largely because it carries a lower price tag than other methods of producing custom t-shirts. Each situation is unique, but obtaining a price quote on digitally printed t-shirts for your business should be part of your due diligence. You just might find that digital printing t-shirts works for you in every way imaginable. Clearly, digitally printed t-shirts carry a ton of benefits with them. No matter what kind of t-shirt order you are interested in making, digital printing t-shirts may prove to be a truly ideal fit. Make sure that you explore all of your options and discover the many benefits of digitally printed t-shirts for yourself.